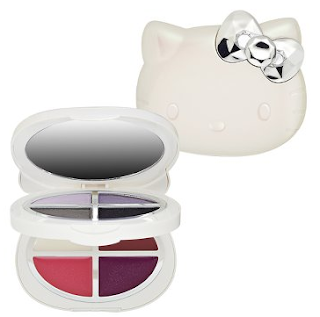 This past weekend, mega-make up merchant Sephora offered a sneak peek at their upcoming line of Hello Kitty themed cosmetics. 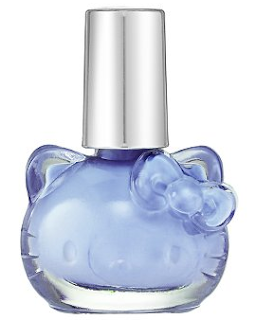 Lucky beauty insiders were able to pre-order everything from lip gloss and nail polish, to shower caps and acne treatments, all created in celebration of the famous feline. 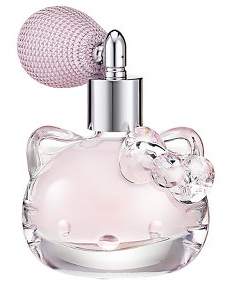 While the pre-sale has since ended, Sephora promises that Hello Kitty Beauty will officially launch in all stores and online in January. In the meantime, I've picked out a few of my favorite items to share! While the line features a rollerball fragrance, body splash, and scented lotion, my favorite selection is this elegant Eau de Parfum. 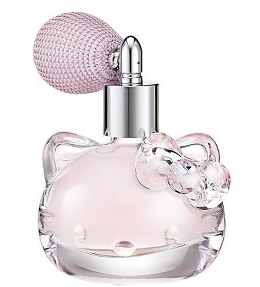 The scent is described as "some of Hello Kitty's favorite things, its notes of green apple and Japanese fruits will make you smile inside." I don't know exactly what that means, but I'll take it! 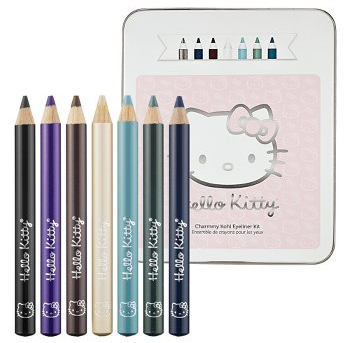 This pencil tin is packed with seven different eyeliners to help you achieve the perfect "cat's-eye" look. Quirky colors from this set include Grape Juice, Chocolate Milk, Bicycle, and Happy Cloud! These delicious nail colors sound yummy enough to eat. Polish your pinkies in Blueberry (pictured), Banana Cream, Bubble Gum, Frosted Cupcake, Minty, and Pink Sprinkles! 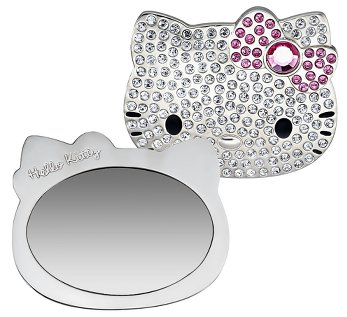 This sparkly purse sized mirror will make you feel super deluxe, and comes with its own velveteen pouch. Moisturizing lip gloss available in fun colors like Charmmy, Gold Fish, Pink Bow, and Grape Frosting. 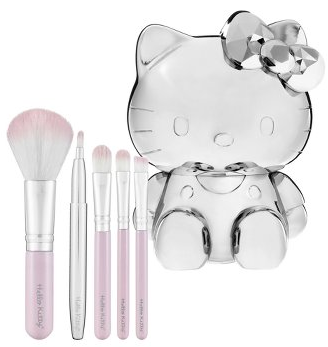 "To reveal the brushes inside, simply lift Kitty's head!" This five piece set includes a face brush, eyeshadow brush, shader/blending brush, angled eyeliner brush, lip brush, and collectible Hello Kitty brush container. 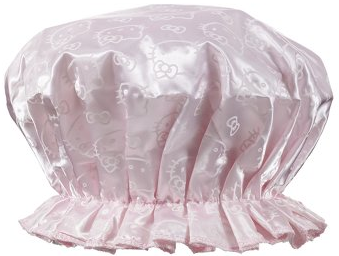 I love me a good shower cap, and this one doesn't disappoint. It "comes in its own pink plastic case that resembles the envelope of a pen pal letter, complete with a Hello Kitty postage stamp!" In addition to all of the items shown above, the exclusive collection also includes eyeliner and eyeshadow, nail stickers, blotting papers, lip treatments, and mirrors. Weren't lucky enough to hit the pre-sale event? Don't forget to stop by your local Sephora or Sephora.com in the new year to get your HK Beauty fix.